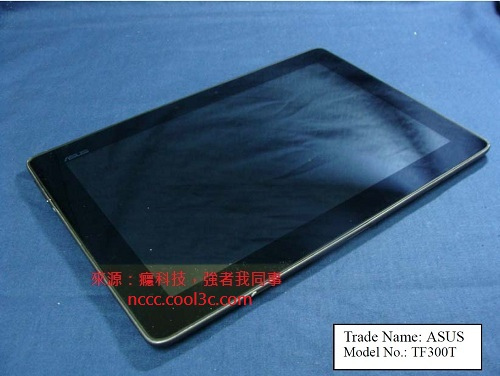 A Chinese gadget blog has turned up photos of what might be the next Asus eeePad Transformer, the TF300T. The first eeePad was the TF101, and the Transformer Prime is the TF201, so this new model number is probably legit. No details have been leaked on the specs or release date, but this does appear to be another 10" tablet with a pair of cameras. The manufacturer was listed as Wistron, a Taiwan company who is subcontractor for lot of the major brands (think Foxconn, only without the scandal). There's speculation that this tablet might be revealed at MWC, which is coming up in few weeks. But I don't see that happening; there's already a new Transformer in the works and this isn't it. Most likely this is the 3rd generation device, and that means we might not see it until the fall. Some corrections: The model number of the first transformer was TF101, Transformer Prime is TF201, and the next model coming out is TF700T. I have yet to see a TF201 in the wild or in stores. It appears they are more interested in making the Tablets than selling them. Acers A500 was gone before you could blink and Asus TF201 has yet to surface in any stores in CA. Considering this behavior I was very surprised to see the percentage of the market these 2 companies are holding. Imagine what they could do if they actually wanted to be in the Tablet business!